The hotel is really well located for a short stay in Dubai with easy access to all key attractions. A metro station is located 5 mins walk from the hotel. The hotel offers a great choice at breakfast. The pool can be overcrowded due to its size against the size of the hotel. Cant fault this hotel. Staff there are well trained , polite and eager to help. 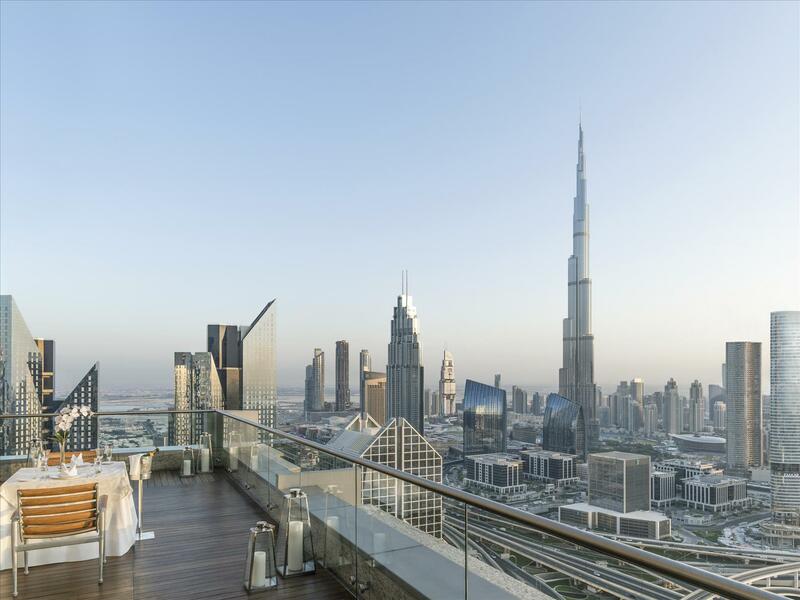 Great views from the deck and room of downtown Dubai and the Burj Khalifa. Breakfast was really good with a wide variety to suit all tastes. Rooms are beautifully furnished , comfortable and thoroughly cleaned. Bed was awesome to sleep in. Free WiFi was fast . We really enjoyed our stay here at the Shangri La Hotel Dubai. Although not our first stay in Dubai it was our first stay at this hotel. Room was spacious and we were given an upgrade on arrival to a bigger club lounge room. The lounge was wonderful, plenty of options of food for breakfast, afternoon tea and evening snacks with drinks. My only complaint was our daughter aged 15 years wasn't allowed in the club lounge for cocktails due to alcohol. As I said before we have stayed in different club lounges in Dubai before and our daughter has always been allowed in during cocktails hours. The reason we were told was due to licensing laws for this hotel. But we could have drinks in the restaurants and by the pool with her so really didn't understand why she couldn't join us for happy hour! Anyhow we still enjoyed our stay and our daughter enjoyed the two hour peace and quiet and free run of the hotel room during this time! Pros: -Nice room design -Comfy bed -Good TV (SmartTV) -Nice and big toilet design, very comfortable -Rainshower and shower tap are superb, easy to adjust taps at the basins. No choking of sewage at max water volumes. -Speakers in the toilet, which is linked to what you tuned in on TV. Has volume control. So I enjoyed MTV music whole day in the toilet!! :D -Complimentary fruits and water in the room -Nicely adjusted air conditioners controls -Features in room are of good, high quality and working well as intended by user (plus points) Cons: -Some waiting time for breakfast queue in the weekends (weekends here are Fri and Sat) -Toilet bowl flush could be made easier to de-press (not a major problem though). Overall, a super nice hotel if the price is not too high during peak periods. Highly recommended. We really enjoyed our stay in Shangri-la Dubai, our room had the best view of the Burj Khalifa and it was really breath taking. Rooms were nice, clean and spacious. Breakfast is great as well, and staff provided the best service. Would recommend this hotel if you are staying in Dubai. This hotel was amazing from the room to the food. Everything was top notch. We went there in July, which was really hot. So, to us, the location wasn't really as convenient but taxis were abundant. So it wasn't really a problem. However, the hotel was really amazing. Good view of the Burj Khalifa and also, exceptional room and customer service. The housekeeping staff basically cleaned our room every single time we went out and we always came back to a clean and neat room. The bed was comfortable and spacious. All in all, a good value for money and we all enjoyed our stay to the max! 9 out of 10 for sure! Check in was very smooth, friendly staff and helpful as well. Location is great where u can find many restaurant and food just outside of the hotel. Upgraded to enjoy free breakfast, high tea and happy hour. Enjoy well on the indoor gym as due to bad weather, outdoor gym was closed. Highly recommend and Worthy stay ever! Deserved for 5star rate! We had a great 7 days at Shangri-La Dubai. Everything was perfect right from the time we checked in. Mitch at the reception made our stay memorable! We enjoyed the cocktails st the executive lounge. Nico and Troy besides the other staff there looked after us very nicely. Thank you everyone at Shangri-La. This was the third time for us staying at the hotel. As always, the quality of the room, bathroom, breakfast, facilities and staff is excellent. We tried the Indian restaurant for the first time and being a big fan of Indian food, I must say that the quality of the food is really good. Specious room, clean and easy/quick check-in. Very near to the Dubai Mall and Burj Khalifa. Staff is friendly and always helpful. We rented a car and the valet parking is easy. We requested a high floor and we got one too. Will come back to the Shangri-La anytime. I booked this hotel for it's view from it's 42nd floor pool spa deck. I was told by a friend who frequently photographs from there that they allow guests to go up for sunrise and the public for sunset. Unfortunately they would not let me up at sunrise and I checked out after that. Other than that everything is as you expected of a luxury hotel, down to bath robes and slippers. The staff was cheerless and all business like though. I had expected them to be more friendly, smiley and helpful considering they are a well known luxury brand. Someone said they were treated like royalty. Maybe I went on a bad day. However it is still a great hotel and if you can afford it you will definitely enjoy the stay. No regrets booking the hotel but disappointed that I could get my shot. I am coming back again in February for longer and will definitely book again but only if the hotel promise to let me up to shoot sunrise and/or sunset. Stayed for 2 nights. The staff were very nice and friendly. Renovations have just started so things could get a little worse before it gets better. Meal rooms changed every day and then toom service was slightly different to what was advertised. But overall very close to the mall and other areas you may want to visit. Room was very clean. I would stay again. Shangri-La is an example of what luxury is all about, amazing service and Hotel, I was upgraded on my very first time in the Hotel to a mesmerising deluxe room. The lunch buffet is delicious with a lot of variety. Booked this hotel due to proximity to Burj Khalifa, had an amazing view of the building. Convenient hypermarket just behind the hotel and the street had a number of great eateries. Only about 20-25 minutes to the traditional souks as well. สถานีรถไฟใต้ดิน Financial Center - ระยะ 0.46 กม.